So turns out, it’s a really simple recipe. Also because I know that my friend doesn’t like to spend much time and effort in the kitchen thanks to her crazy schedule at a media office, so it’s pretty doable. All she does is, soaks half a cup of oats, some chia seeds and banana slices in soy milk in a mason jar and leaves it sealed in the fridge overnight. Next morning she tops it with nuts and any other fruits and Voila! I decided to give it a try but I didn’t have any chia seeds. I checked with her if it’s an essential part of the recipe to which she said it’s okay if you don’t use them but they do help to ‘thicken the plot‘! She’s a writer and a filmmaker fyi. After a couple of tries and some online research (like here and here) I have finally come up with a Overnight Oats recipe that works for me. Like most of our recipes on Kitchenpostcards, this one is inherently customisable. Top it up with whatever you like! A few pointers before you start. Bananas, Chia Seeds and a pinch of Salt! Don’t miss out on the pinch of salt because it definitely makes the oats taste better. Otherwise they taste really bland. And I highly highly recommend using bananas and chia seeds. 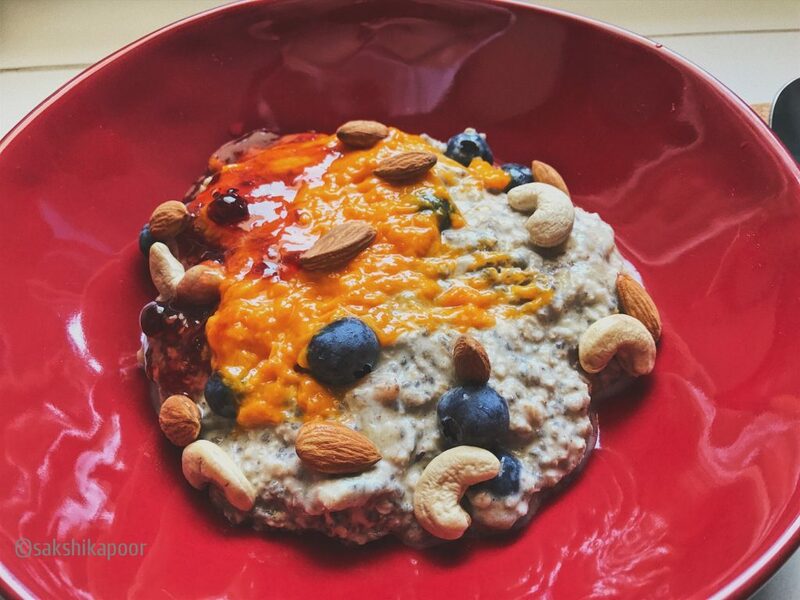 They make your breakfast oats more filling and healthy. Unless you hate bananas. The amount of milk you use depends on the amount on oats you use. Usually double the amount of oats works but the oats and chia seeds will soak up all the liquid and if there isn’t enough of it them your oats will not turn out very creamy. So a little more liquid won’t harm. Now my friend obviously makes a Vegan version of the recipe where she does not use any dairy or honey. You can choose your ingredients according to your food preferences too. Here’s how you can make an Overnight Oats breakfast for yourself and feel like you’re doing great at this thing called Adulting! Take a sealable container to prepare the oats. 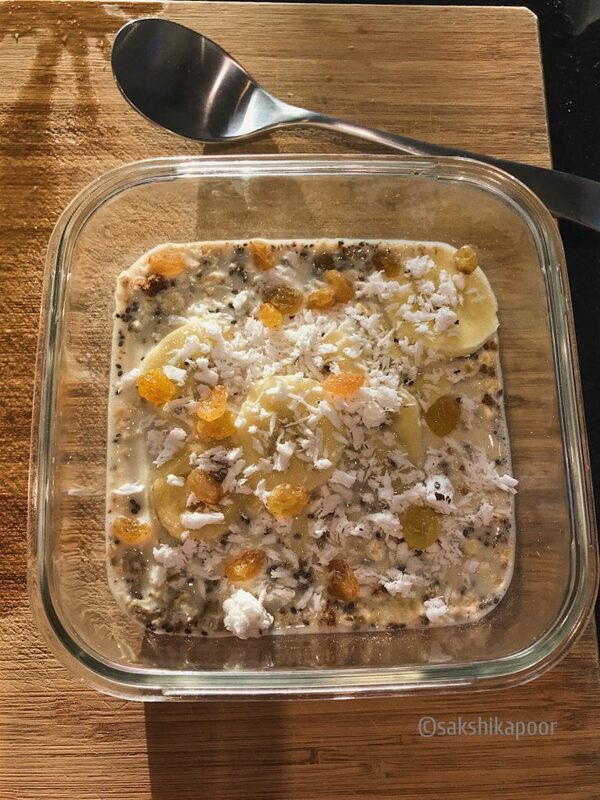 Add the oats, chia seeds, pinch of salt, raisins (if using) and bananas and give it a good mix. Pour milk of your choice. I prefer using soy milk but I don’t always have it so regular milk is also fine. Add in the tablespoon of yogurt if you are using it. Mix the contents, shut the container and store in the fridge overnight. Banana, Chia, Oats, Raisins and Grated Coconut mixed with Soy Milk ready to be stored overnight! Next morning or 4-5 hours from when you soaked them, take out the container from the fridge and give it a good stir. You will find that the bananas look almost caramelised and dark. That’s a good sign because they are going to have a “melt in the mouth” consistency! If you want you can pour the oats in a big bowl or else put the rest of the ingredients on top. Next put any fruits, berries, nuts, syrups and nut butter or whatever you like on top and start your day with something healthy and yummy! 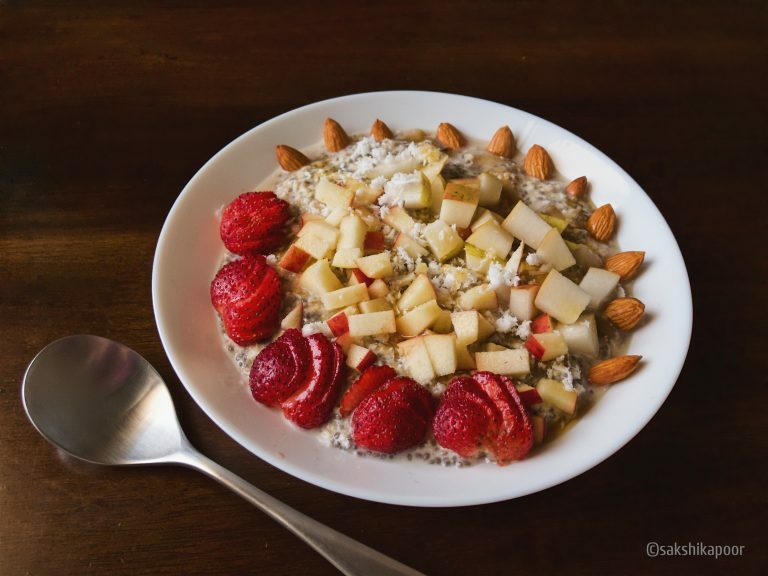 Enjoy Overnight Oats with some English breakfast tea to start your day right! A delicious creamy treat first thing in the morning sounds like a great idea. But the bonus is that these Overnight Oats are healthy too! Pour milk of your choice. I prefer using soy milk but I don't always have it so regular milk is also fine. Next morning or 4-5 hours from when you soaked them, take out the container from the fridge and give it a good stir. You will find that the bananas look almost caramelised and dark. That's a good sign because they are going to have a "melt in the mouth" consistency!